This entry was posted on 2016-06-29, 07:13 and is filed under Machine Shop. You can follow any responses to this entry through RSS 2.0. Both comments and pings are currently closed. 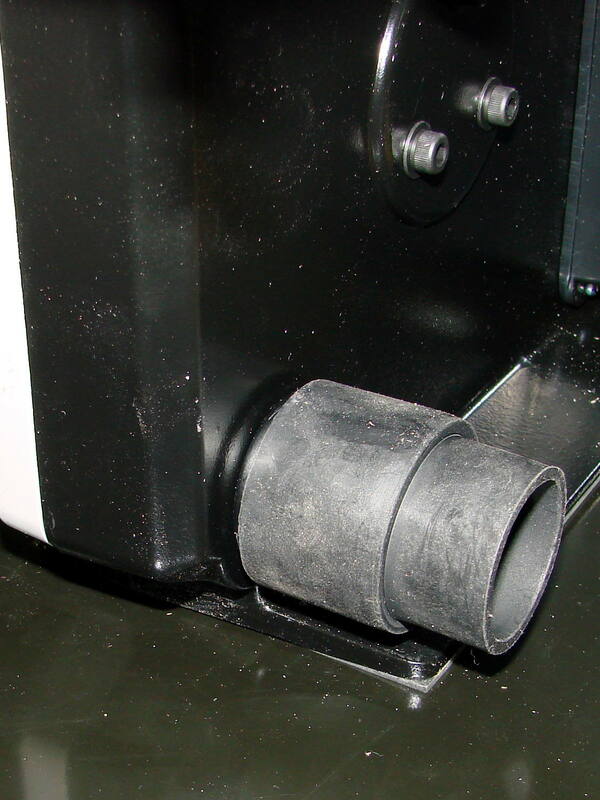 What are the hose barbs for on the underside of the bandsaw table? I came up with several possibilities but then I figured I would just ask for everyone’s benefit. Those fit into drain holes tapped into the table gutter. I haven’t mounted the short plastic tubes that (are supposed to) guide coolant into the pan under the saw, nor the longer one draining the pain into a bottle I have yet to provide. The coolant (water, methinks, perhaps with a dash of TriCool) exits the bottle through a hose into the upper blade guide. With some luck, most of the juice will slobber all over the table, with the remainder slung off by the tracking adjustment before it goes ’round the lower pulley. I’m not looking forward to the cleanup, but I have a glass cutting project in mind that won’t work well with the usual straight-cut tile saw. I guess that was the one thing I had not thought of; using a normal bandsaw as a wet version. And yeah, probably messy. 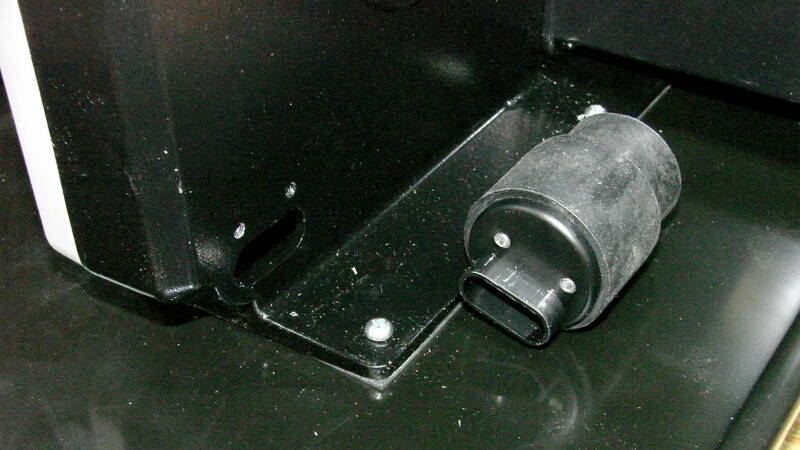 Consider adding some rubber wipers on the underside to keep coolant from making the full trip through the system. There’s a tiny foam block on the uphill side of the lower pulley that I expect will be long gone by the time I need it. A 3D printed widget with rubber lips, mounted on the same screw, seems appropriate. 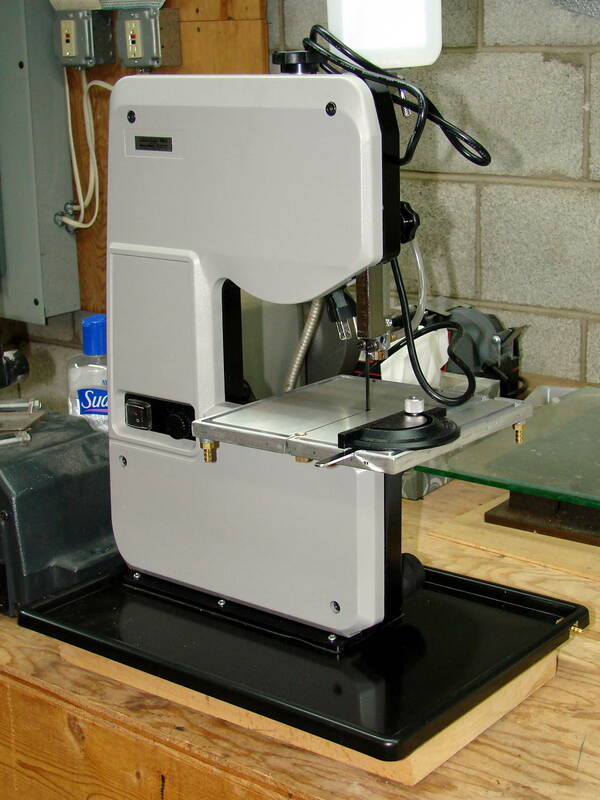 I picked up a decent Delta tabletop bandsaw at a garage sale for $40, with no blade. It’s a bit of an orphan, documentation for it is scarce, so I had to guess at the blade length. Of course, it turns out that the blade length is none of the common ones, so my first couple of guesses were wrong. After I finally obtained the right blade, it works really well. One thing I use it for frequently is cutting printed circuit boards, which are annoying to cut with most methods (a chipbreaker router bit in a mill works, but that’s slow and a lot of setup). With plenty of vacuum to catch all those little bitty glass fibers! I’m fiddling up a better vacuum setup for this thing than the quarter-assed lashup on my old Delta bandsaw; that thing chewed through PCBs wonderfully well. Enco used to sell an earlier version of that saw. I bought one (used) in the ’90s for a telescope project that needed to shape some really thick glass blanks. As it turns out, 2″ thick (roughly) glass blanks are rough on a bandsaw blade, and replacements were 1) hard to get in the right length (might have used 1 meter blades), and 2) really expensive in diamond. A diamond replacement cost more than I had in the saw. Later, I got Julie’s father’s 14″ saw, and after making a spacer block so it would use 93-1/2″ standard blades, it’s my woodworking bandsaw. 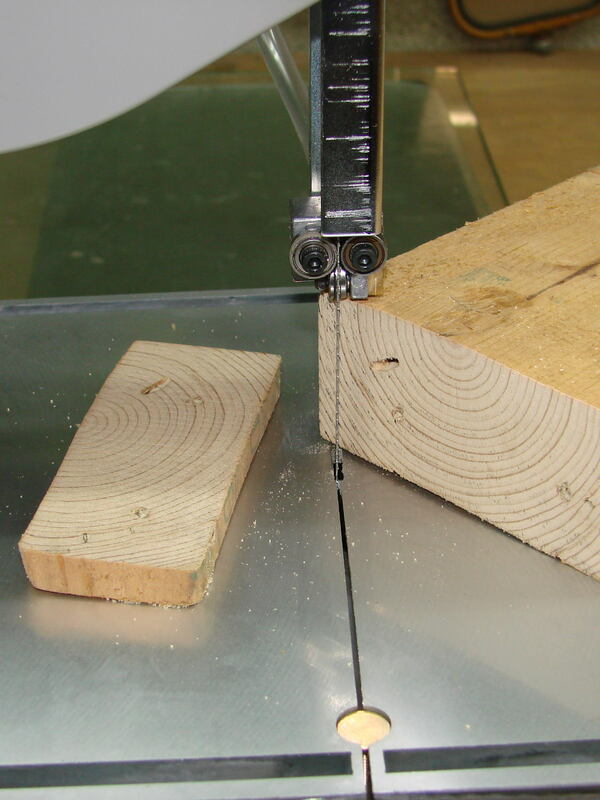 I’d done mildly creative stuff on the 4 x 7″ metal cutting saw, so the Enco was redundant. I want to do speed reduction on the 14″ one, in my allegedly free time. Two inches of glass? You the Man! The (spendy) diamond blade should only see quarter- to half-inch glass & slate slabs and I’m going to treat it with exaggerated respect. Not that much; life got in the way. I really want to get an 8″ Newtonian done, so I can enjoy the dark skies. The thick chunk is an octagon now. It might turn into a Maksutov corrector one of these days.